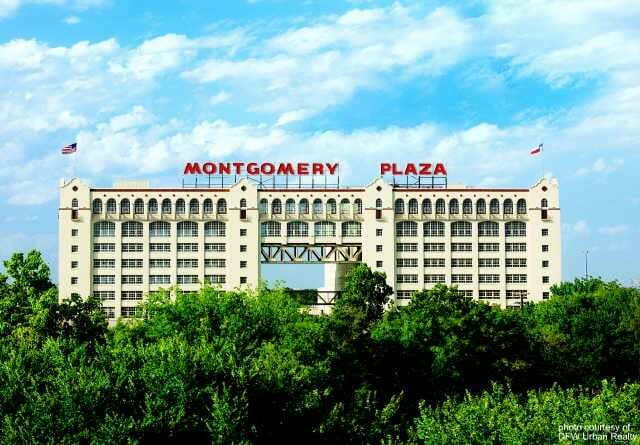 Until it ceased retail operations in 2001 Montgomery Ward occupied the iconic west Fort Worth building that now houses some of the city’s most popular and luxurious condominium residences. Growing up in Fort Worth we all knew the story of the 1949 flood that left a big stripe around this well-loved building at the second floor. That stripe was painted over when the building was redeveloped as condominiums in 2004. I still look at it really hard though whenever I drive past to see if I can see where the famous water-line once was. The line is long gone though, as is the threat of flooding since the Trinity River was tamed by levees in the decade following the big flood. Today the 7th Street Entertainment District is one of Fort Worth’s most popular destinations, brimming now with small and large retailers, restaurants & clubs. Residents of the area can live and play along 7th without ever hopping into a car. This is a lifestyle change for Texans, used to driving everywhere we go. If you’re lucky enough to be retired or work at home, you may not even need to own a car here. There’s a Super Target, a salsa bar and a bowling alley all within a tenth of a mile from your home… and lots more. The giant Mission-Revival building now called Montgomery Plaza houses 240 luxury condos from 1 to 3 bedrooms. The walls are 12 inches of solid concrete so all of the fun that’s going on below won’t keep you awake at night. The crowning glory of this site is the roof-top deck with a resort-like pool that rivals the finest Urban resort hotels in Dallas, L.A. or even Las Vegas. When viewing Montgomery Plaza Condominiums it’s helpful to understand the unit numbering. There are 2 towers. The units in the West Tower begin with a “1” and the units in the East Tower begin with a “2”. The second number in the 4-digit unit number is always the floor level and the last 2 numbers are the unit numbers. The West Tower (1) is home to the popular rooftop pool deck, Resident’s Lounge, Media Room and Fitness Center. Units on the West Side of this tower enjoy a view of 7th Street and the Cultural District. The East Tower (2) has a restricted access community on the two top floors (7 & 8). These are known as the “Private Residences at Montgomery Plaza”. The private residences on 7 and 8 have a separate secure underground parking garage with direct access elevators. Units facing East have views of the downtown skyline. The Resident parking floors are in the East Tower so getting from your car to your condo is quicker. The parking garage is connected to West Tower residences by a skybridge. A train track runs next to the building on the East side so residences on the outside of the building may experience some train noise.